When we entertain over the holidays, we generally start off the party with sparkling wine -- there's just something extra festive about a sparkler. And it goes great with seafood appetizers, like cooked shrimp or our family favorite, oysters on the half shell. If you're having a big party, consider setting up an oyster bar, and find some young person who is willing to sit and open oysters for an hour. It's a great way to meet virtually everyone at the party, and there's an easy to follow video on our website that teaches how to open an oyster, Click Here for "How to Shuck and Oyster." crackers, our party trays require nothing more than a table to put them on. Vegetarians on your guest list? Try some of our pesto on toast points -- lightly toast some bread, then heat up your broiler. Cut the crusts off the toast, spread with pesto (various choices: Sun Dried Tomato, Artichoke, Poblano, Arugula etc. ), cut into triangles and put under the broiler on a cookie sheet for moments -- serve while still warm. We generally have two or three varieties of herring in sauce during the holidays, always popular around New Years, and all you add is crackers and toothpicks. We should probably sell toothpicks. For dinner parties, we have our elegant fresh salmon entrees, Papaillotes (perfect for Christmas Eve or Christmas day - already gift wrapped! ), Salmon Cozies (wrapped in puff pastry) and Stuffed Salmon Fillets - when you place an order, we make them up just for you. We can also order in something really special for you, such as genuine Dover sole or French turbot, as long as you're willing to pay the high price these wonderful fish command these days. French turbot is my all time favorite fish, and I was thrilled to be able to get it at a reasonable price in Italy two years ago. It's getting it from there to here that costs so much. For a more casual party, where everyone is willing to eat with their hands, there's nothing better than live lobsters, crab legs (already cooked, just thaw and warm), or lobster tails. If you click on the link above for oyster shucking directions, you'll also see our videos on cooking lobster tail and warming up king crab legs. All of these go well with melted herb butter, or for something lighter, serve with our Lemon Dill Sauce. Mussel Recipes. Just add lots of crusty bread and a green salad. I like to add fruit to my salad, and this time of year the clementines are readily available, as well as avocados. I sprinkle a little goat cheese over the top and serve with my homemade vinaigrette. An easy, delicious salad with many seafood dishes. The Italians go quite fish-crazy on Christmas Eve - The Feast of the Seven Fishes is something that many of our customers have done over the years. If you're taking on a challenge such as this, and you need something special, such as salt cod, please call and order in advance -- though we often carry many unusual things, such a lutefisk and whole tube calamari, be sure to call in an order. If there's a run on lutefisk, we want to be able to get more in for our Scandinavian friends. I must say, I've never worked up the courage to try lutefisk. I guess you have to grow up with it. Let us know what special items you need for your celebration, and we'll do our best to get it in for you. Ask us for seafood suggestions, wine suggestions, side dish suggestions - we even do dessert. Whether you're a fabulous cook who just wants great ingredients, or an "I can barely turn on the oven" cook, we can help you serve up a fabulous holiday meal for friends, family or just yourself. When the Pilgrims invited the local native tribe, the Wampanoag, for a harvest dinner, it's not completely clear what was on the menu. Culinary historians believe that much of the Thanksgiving meal consisted of seafood, which is often absent from today’s menus. Mussels were abundant in New England and could be easily harvested from the rocks along the shoreline. 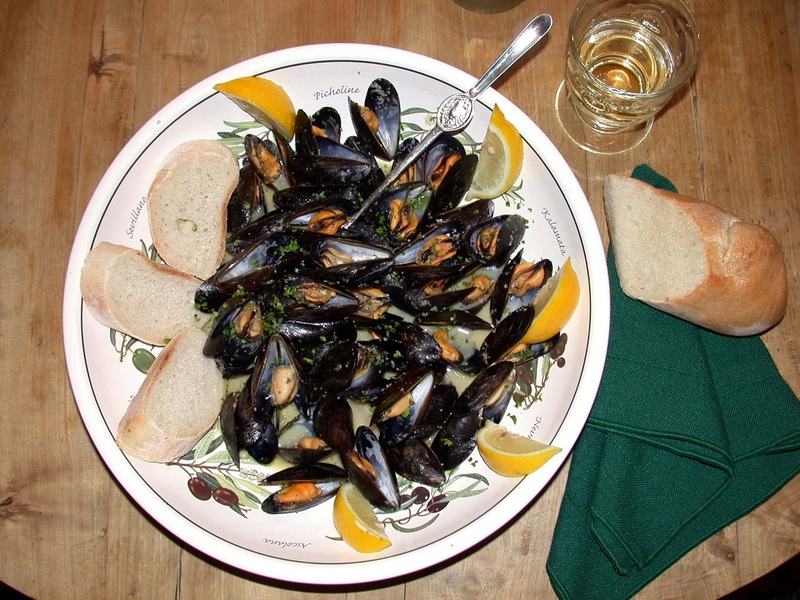 The colonists occasionally served mussels with curds, a dairy product with a similar consistency to cottage cheese; we serve them with cream, not so far off. Lobster, bass, cod, clams and oysters were most likely also part of the 3-day feast. One thing we do know from letters from one of colonists, only the men of the Wampanoag tribe came to the event. They brought venison, still on the hoof, so to speak. I can only imagine the conversation on the way to the feast - one of the Wampanoag says "Do you think we should bring something?" when a small herd of unfortunate deer appear. Bam, five dead deer for a hostess gift - just not gutted, skinned or ready to cook. They were handed over to the Pilgrim women to clean and prepare for the spit - it's no wonder the event lasted three days. One wonders why the native women weren't invited - or perhaps they declined the invite to stay home and not have to do much cooking for a few days, for which they were undoubtedly thankful. 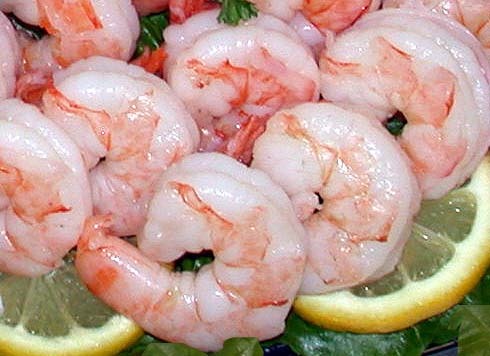 For those of you who are not cooking this Thanksgiving, but are going to partake with friends or relatives, I have a venison-free suggestion as a hostess gift that doesn't require any preparation at all - take some of our cooked shrimp with cocktail sauce, some oysters (East Coast to go along with what the Pilgrims ate), some smoked salmon, or one of our tasty spreads. No skinning or gutting involved, though someone will have to open the oysters -- we have an oyster shucking video on our web site - check it out here. Your host/hostess will thank you, for bringing something wonderful that requires no work on their part! The outpouring of sad messages from our Glenview customers has been both heartwarming and heart breaking -- staff has been so happy to see the customers who have driven down to Hinsdale for their fresh seafood. Now that's loyalty! We are talking to a number of potential delivery services, the only concern being that the majority of them are designed to deliver hot food, and virtually all of our food needs to be kept cold. We particularly want to get something set up before the holidays, because of the demand for our cooked shrimp and party trays. We have talked to several companies, we will keep you posted. Salads & Sides - rice dishes, potatoes (Herb Roasted, Garlic Mashed), Broccoli Salad, Almond Green Beans, Tuna Salads (Nutty or Cranberry) etc. If there is something you would feel is a great potential delivery item, let us know! As this is a work in progress, we won't know for a while if it will be viable. We hope so, for the sake of all our sad customers. We didn't want to close the Glenview store, but the rent was killing us. The landlords there (Regency Centers) are the partners of all the Marianos opening in the Chicago area (soon to be owned by Krogers), a very big mall management company that was happy to charge us the highest rent/sq. ft. in the center. When we told them over a year ago that they would put us out of business, they basically let us know that they didn't care. So those of you who are angry with us for closing, please transfer your anger to them! We will keep you posted on the potential delivery service - if you know of a possibility that we may have missed, let us know. Some of the aquariums in the US started issuing wallet cards, advising people on what were good fish to eat and what were not, based on a variety of criteria. They basically told people not to eat farmed fish, and not to eat certain species of fish that may truly be in danger, though some that they warn you about are fine to eat, depending on where they're caught. Example: East Coast cod is on the bad choice list for many aquariums. However, the New England fishery is now being well managed, and the fish has rebounded very quickly. When it's available, it's a wonderful fish, and you don't have to feel guilty eating it. The Icelandic cod fishery is one of the best managed in the world, and Icelandic cod is always a good choice. Pacific cod, very similar to its East Coast cousin, is also from a well managed fishery, as long as it's from US waters - cod imported from Russian and Asian waters is still being over fished. Ours comes from US waters. Recently, many farmed fish have been added to the "Best Choice" lists, because the aquariums finally realized that in order to feed people and maintain wild stocks, there has to be a farmed alternative. Some of the ones they mention include Arctic char, sea scallops, shrimp, barramundi, yellow perch, oysters, mussels and clams. One fish they refuse to recognize as a good choice is farmed salmon, because of issues with Atlantic salmon being raised in Pacific waters. Wild salmon fisheries were terrified of escaped salmon co-mingling with the Pacific salmon and damaging the species. Perhaps a valid fear, but we don't buy Atlantic salmon raised in the Pacific. All of our raised salmon comes from operations that we know to follow sound environmental practices, off the east coast of Canada and the west coast of Scotland. Seafood species that are particularly in danger (and we don't sell them for that reason) include warm water lobster from South America and the Asian Pacific - these are the cheap lobster tails you see in box stores and chain groceries that are cheaper than cold water tails - and they are being wildly over fished. We get our tails from Maine, a well managed fishery, and North Australia, a very successful operation managed by native Aborigines near Darwin. Blue fin tuna has been fished almost to extinction, largely to feed the Japanese, and we don't sell it. We also don't sell Caspian Beluga caviar - also horribly over fished. During the holidays, we sell American sturgeon caviar, which is wonderful, from sustainably raised fish, and much cheaper. The aquariums tell you not to eat imported mahi mahi, not sure why, but don't mention American caught mahi, which is plentiful and delicious. "Key actions that helped the West Coast ground-fish rebound include greatly increased government monitoring and control of fishing boats’ take, assigning fishing quotas to individual fishermen rather than to types of fish, and closing off some areas of the ocean to safeguard vulnerable habitat..."
It took just 14 years to rebuild the fisheries and get them back to a sustainable industry. The bounty that comes from our lakes and oceans is one of our greatest treasures. Those of us in the seafood industry who rely on the resource want to preserve that resource for future generations. The best thing that you can do, as seafood consumer, is know your fishmonger. And stop avoiding raised seafood - as long as you know the source!! Where do you get your wild beef, chicken and pork? Responsibly farmed seafood will save wild stocks, and that's vital to the future of the only food we still hunt for public consumption.